We`ve named our vacation rental home NAUTICA because it sits directly on the Atlantic Ocean and is surrounded by the sea. This a special place in many ways & is 2 bedrooms & 1 1/2 bathrooms. The house is decorated with some really incredible, unique items The view from the ledges in front of the house, the ocean breeze and frequent wild life and birds will mesmerize you. Don`t be surprised to see a group of seals swim by I call the sea side or front of our home a wall of windows. You can see ocean views from almost everywhere in the house. There is plenty of natural light. You can see the wood porch in front and can use it to sit outside in the open sea air. I can only describe the many puppets and miniature models in the house as FUN things we havve collected through the years. From a telescope to a miniatured palace and many puppets. We hope you enjoy them as we do. We love sitting here listening to the waves against the shore, watching the birds and the weather change, all while in our cozy living room. ...I thought I`d give you another ground level view of the living room and kitchen dining table. And in a few photos from here... you`ll be able to see an arial view from the loft upstairs. Down on the ground floor, and from the living room, you can see the open air loft upstairs You can also see our speaker system and we want you to feel free to use the stereo and listen to your favorite music. ..here`s an arial view of the living and dining areas from the loft above I love to cook and am always pleased to have guests who are going to dine in. Everything you need for a feast is here. You`ll feel right at home. This kitchen has seen many a lobster feast. Theirs nothing like ocean front dining. Eat inside or outdoors. The dining room table can fit 7 guests easily ...and one last view of the dining table and ocean. I watch the seals go by with the telescope It`s there for you to use I`ve put the next few pictures in so that you can get a complete feel for the place. This is the front door and hallway. You can get a feel for the decor and how much pride we take in keeping it up to snuff for all of you. Here again, you can see the neat design and art work throughout the house. Its all very neat and clean. Let me now show you our two bedrooms The master bedroom - with puppet hanging from the ceiling - has a queen sized bed. Its firm and comfortable. You`ll also like the large closets. ...here`s another view of the master bedroom. ...and finally the ceiling to floor windows in the master bedroom facing the ocean. Close your eyes and imagine opening the windows while in bed and listening to the waves crash against the shore. The opened air loft has a full-size Futon couch that can be used as an alternative sleeping area. The room has a large round window letting in a lot of natural light. The loft sky light is especially brilliant during a full moon. Viewing a starry sky from here is also a nice way to fall into slumber. The second bedroom with double bed on the second floor ..and from the Second Bedroom`s Side Window you can peer out at the rocky sea shore. The bathroom is spacious with a tub. With plenty of natural light and electric outlets I always find it a pleasant space to bathe in. We also have a stall steam shower and towel warming rack for extra comfort. Picture perfect is the view from this window. You never quite leave Nautica as these sights become pictures in your mind that you long for year after year. We`d love you to enjoy our home on the sea. 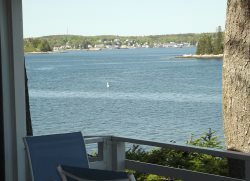 A treasured family home at the edge of the Atlantic Ocean is ready for you to settle in for a memorable Maine Vacation. This two bedroom, one and a half bath cottage is well equipped and comfortably furnished throughout. Its vaulted ceilings and open-concept floor plan offers plenty of space for two generations to enjoy time together. THE HOUSE: A typical cottage style with weathered shingles and a coastal feel on the inside. Perched atop a knoll with a front yard of age-smoothed rocks that tumbled to the sea. The first floor - Master bedroom with one double bed, One full bathroom with soaking tub and separate steam shower. Large entry area with hallway leading to living room and dining room stretching across the waterside section of the house. Tall windows let in lots of natural light and 180 degrees of water views. The second floor - Second bedroom with one double bed, One half-bathroom.TV Room loft overlooks the living room and dining areas, Futon couch folds out into a double bed. BATHROOMS: (1) Full bathroom with tub & separate steam shower, sink & toilet on the first floor, and (1) Half bathroom with sink & toilet on the second floor. Guests will enjoy access to several sandy beaches, nature trails through marshes, tidal sand flats, and miles of gorgeous rocks. Don't forget the spectacular oceanfront views of Cuckolds Lighthouse and the Seguin Island Lights! Start your mornings with beautiful sunrises and end them with breathtaking sunsets. Located in the small private community of Indian Point in Georgetown, the views of the Atlantic are sure to please. We had a wonderful week. A queen bed in the master bedroom would have been nice. Also, ability to use pool table. Nice stay with efficient check in, check out and prompt service call resolution. The sighting of the property is very good. You can see, hear and smell the ocean, but you are not so close to sandy areas that you are pestered by the bugs. The main living space is quite comfortable. Being close to the sea, sea kayaking and nice place to read with a kayak paddle to Seguin was great. Maine Maritime Museum was very good. Appreciate the short blazed hiking paths. The cottage is a great spot to eat in. We require at least 72 hours notice of intent to rent so the cottage can be prepared for your stay. Cottage address, driving directions and lock box combination will be e-mailed to the guest TWO WEEKS prior to their scheduled arrival. Swimming Area Rating 5/5: Sandy or pebble beaches nearby, great for all ages!